Specs has over 20 years of experience in the processing of chemical compounds. This experience is now offered to the pharmaceutical industry. 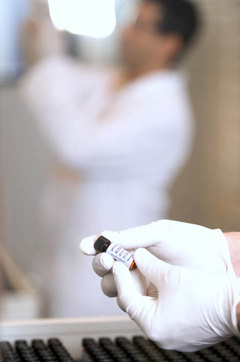 Specs can reformat entire compound libraries, including labeling of the vials or plates to the customers individual requirements and quality control (LC/MS and 1H-NMR) and compound registration (structure drawing). Specs has more than 20 years of experience in research sample processing to the pharmaceutical and biotechnology industry in North America and Europe. Many projects have been successfully completed in these regions. The success of Specs doing these projects has led to the creation of a Specs compound handling facility in Maryland, USA. The European projects are being done at the main facility in Delft, The Netherlands. Regarding the plating process, research samples are weighed into new uniquely barcoded tubes and the compounds are dissolved and plated in either 96-well or 384-well plates (depending on customer specifications). Duplicate plates can be created with the same high degree of accuracy. Specs can also create backup sets, sometimes called "disaster sets", of compounds that can be stored at the mentioned facilities. Storage conditions include ambient temperature, refrigeration and -80:C freezers. Furthermore, Specs can also setup and perform compound handling projects at the customer's site. Specs' task in this is to analyze and process the existing historical collection so that it can be used more efficiently in the customer's storage and retrieval systems. The advantages of these operations are significant. With the speed of processing the collection by Specs, the compounds are available for screening much faster and a lot of valuable time is saved in the drug discovery process. With these projects the customer is released from the overall organization and investing in personnel, hardware and software. All requested activities in the project will be carefully implemented in customizable software that controls every step of the process by barcode reading.